Mr. Stovall has been in the therapy industry since 1997 and has experience in outpatient, skilled nursing, long term care, and pediatric care. He has received numerous awards including Chicago Medical School Allied Health Outstanding Clinician and Murray State College Outstanding Clinical Instructor 2 years. Shane presents lectures to the Murray State College PTA and COTA program including spinal cord rehabilitation and changes in Medicare rules and regulations. He is passionate about the rehabilitation profession and believes quality care is the best marketing tool a company can have. He founded Prohab Therapy Specialists on one premise: Surround yourself with clinicians who are eager to learn and serious about representing the rehabilitation industry in a positive manner and you cannot fail.Shane is married to Sheli and has two children Tyler and Dylan. Sean O’Halloran graduated from the University of Oklahoma Health Sciences Center in 2000 with his degree in Occupational Therapy. 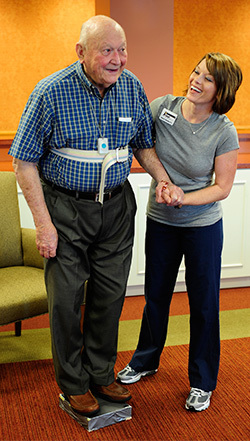 He returned to Tulsa to begin his professional career at Saint John Medical Center in acute rehab and The Center for Joint Replacement before transitioning to skilled nursing and long term care facilities. Sean served as Director of Rehabilitation and Director of Facility Operations for several area nursing homes before becoming a Regional Director of Therapy. Sean now serves as Chief Operating Officer and provides Occupational Therapy evaluation and treatment to several of the central and northeast Oklahoma facilities. Sean is married and has a daughter, Bella and a son, Beckett. Mrs. Wlodarczyk has over 19 years of front office experience in the long term care, skilled nursing, and rehabilitation industry. Her extensive knowledge of Medicare Rules and Regulations has made her a valuable resource for several Oklahoma companies. With a strong background in Medicare billing, she has overseen multiple facilities in the daily billing of Medicare, Medicaid and Commercial Insurance. Erin’s passion is in the accounting field. Her experience includes processing accounts receivable, accounts payable, general ledger and payroll. Her pursuit for perfection has helped her become an invaluable asset. She has a strong work ethic and proven ability to manage employee’s needs while handling multiple projects. In June, 2010 Erin married Wes Wlodarczyk.